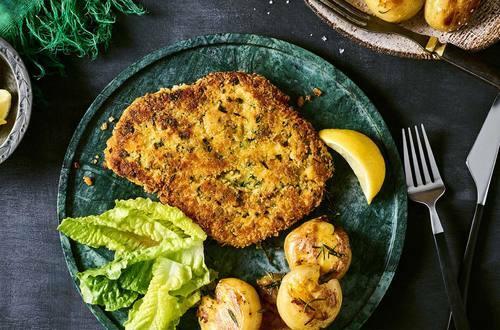 Have dinner on the table in 30 minutes with this deliciously crispy chicken schnitzel. A tasty, much loved family favourite. 1 Cut each chicken fillet in half lengthways. Place each piece between 2 pieces of cling wrap and using a meat mallet or rolling pin beat until flattened. 2 Combine Stock Powder and flour and use to coat each piece of chicken. 3 Combine breadcrumbs and parsley. Dip each piece of chicken into beaten eggs and then coat with breadcrumb mixture. Repeat until all pieces are crumbed. 4 Heat oil and shallow fry the chicken in batches for 4-5 minutes each side until golden and cooked through. Serve with roast potatoes and salad.